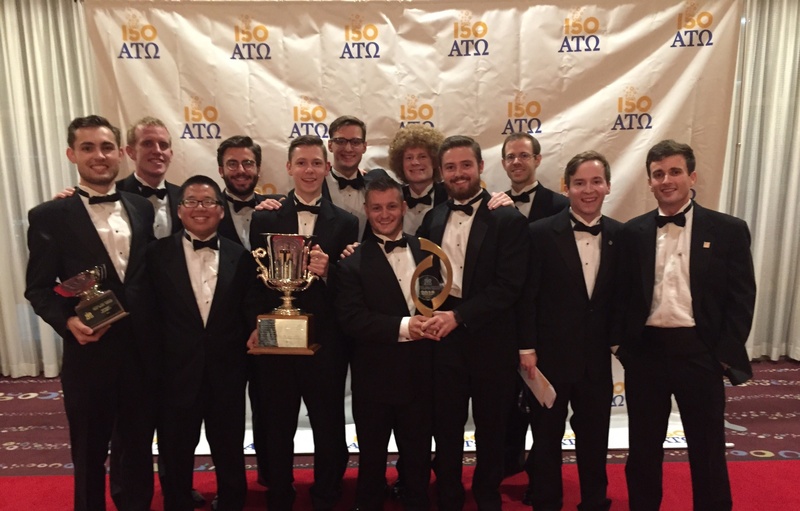 Belmont’s Iota Phi chapter of Alpha Tau Omega accepted the organization’s highest national award, Top Chapter, at ATO’s 150th Anniversary Celebration Weekend in Indianapolis, Indiana on August 8. The chapter also received the Gold Award in Communications Excellence and their fifteenth True Merit honor. Established in 1969 and given to chapters that meet a high standard in philanthropy, recruitment, brotherhood and scholarship, the True Merit Award is given based on an annual report detailing the year’s accomplishments that is compiled by the chapter. Iota Phi has been awarded the distinction for each of the fifteen years since its chartering. The Communications Excellence award is given to chapters who excel in internal and external communications systems. Belmont received Gold for their use of social media, alumni and parent newsletters and coverage by local news outlets. The Top Chapter Award is given annually to the single ATO chapter displaying the highest chapter-wide standards. A panel of judges uses the chapters’ Annual Reports to pick their choice for this prestigious award, and the panel then uses each judge’s individual pick to select the winner. The chapter’s Annual Report described a number of milestones including raising more than $36,000 for their local philanthropy, Blood:Water Mission, a record-breaking total for Belmont Greek Life. Raised by the hosting of four signature events, chapter members also served a total of 11,240 community service hours throughout the past year. In both fall and spring recruitment, Iota Phi achieved record totals for new members using a values-based recruitment model. A delegation of ten undergraduate chapter members and alumnus Jon Burt were in attendance. The weekend included leadership seminars, networking opportunities and a trip to the Indianapolis Zoo and ended with the annual Awards Banquet.